I recently went back to the first few posts that we ever created on this blog, and I found a bunch of our early presentation skills videos. Back when we first started teaching public speaking classes, we weren't conducting hundreds of classes every year like we are right now. So, to create these videos, I actually went to my local library. (Yup, at the time, I was too broke to be able to even afford a hotel meeting room.) Although the video quality is really poor compared to what we have today, the content of the videos is still pretty good. Take a look and let us know what you think. And yes, I have lost a few pounds since these videos were recorded. This first video is about stage fright. I explain where it comes from and how to eliminate it. Public speaking is just like any other skill in that if you try the skill and have a success, you gain confidence. If you try a skill and have a failure, you get nervousness. That's one of the reasons why we suggest that you get a good coach during the learning process. A good speaking coach can help make sure that you have a series of successes so that your confidence grows. In this video, I give a summary of what used to be the opening session of the 2-day Fearless Presentations ® class. In the video, I cover a few tips to help people reduce nervousness. I cover things like realizing that most of that nervousness that we feel on the inside doesn't show as much to the audience. You should also never try to write our a speech word-for-word. If you do, you'll likely just want to read it. In addition, don't try to memorize a canned speech. It will just make you more nervous if you lose your train of thought. A bunch more tips are on the video. Enjoy! This is a quick overview of how to design a presentation in a way that will make you less nervous. What most people do is start with their PowerPoint slideshow. They create slides and bullets for every single thing that they want to speak about. Then, they will try to speak about what is on the slides. That is backwards. It is much easier to create the presentation first. Then, after you have a great presentation, decide what visual aids you will need to help you explain the content. If you prepare for your talks in this way, if something happens and your slideshow crashes, you can still perform in a confident way. This tip is a very practical way to reduce fear just before you speak. Show up early. The last thing in the world that you want to be doing before a presentation is to be rushing into the room unprepared. Show up early. Network with your audience. (This will help you customize the content better.) In addition, it gives you an opportunity to make sure that all of your visual aids are in order. A few years ago, I was training an instructor, and we were to speak in the morning at a conference. We got a hotel that was .2 miles away from the office building according to the booking website. We ended up get to our hotel pretty late at night, and since the meeting location was so close, we didn't really bother to scout out the building the night before. We just got up a little early so we'd have plenty of time to get there. The instructor that I was training had just purchased a GPS, so he was anxious to use it (this was before GPS' were built into our phones.) When he plugged the address in, though, the location was showing our destination on the freeway service road on the same side of the freeway from us. Consequently, we had to go across the overpass, get on the freeway, go down to the next exit, and come back up the service road that our hotel was on. We went rushing into meeting sweating bullets. As I began setting up my computer, I looked at the clock. We were still there about 15 minutes before our start time, but the entire audience was already there. So they saw us setting up. I have never felt more pressure before a class. If you want to avoid challenges like this, show up early! One of the secrets of most highly successful people is their ability to communicate their ideas with confidence. Potential class members sometimes ask us if they can expect to get a big return on their investment if they attend a training program like our. We always tell them, "YES!" People who can communicate with power and conviction are often seen by others to be leaders in their industries. A good example is a surgeon. Let's say you have to have a minor surgery. Just before you go under anesthesia, the surgeon comes into your hospital room and is wishy-washey. As the surgeon speaks to you, you see his hands shake a little. Are you going to get a second opinion? Of course you would. Guess what? That is the type of impression we are giving to our audiences as well if we are nervous speakers. The good news is, though, we know of a place where you can conquer this fear! Should I Travel Out of Town to Attend a Training Seminar? Doug Staneart is a keynote speaker from Dallas and CEO of The Leader's Institute. In this video, he shows how to determine if your return on investment from attending a training program out of town is large enough to justify the expense of the travel. The advantages to traveling out of town are that you are less distracted and can focus on the material being taught in the program better. You also get to capitalize on the skills developed in the training program much FASTER. A small investment in travel can generate higher incomes for the rest of your life. I look back on these vintage videos, and I laugh a little now. So go ahead and poke fun at me if you like. 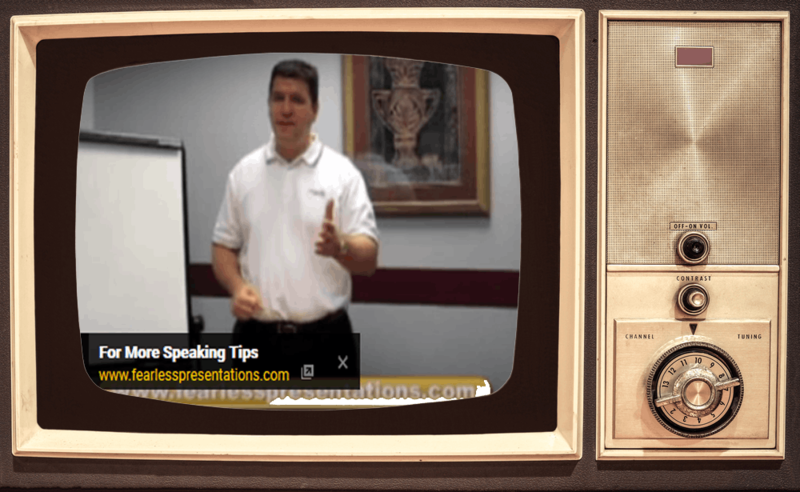 However, these early videos were what allowed us to reach the masses and start helping people eliminate public speaking fear. Now that I think about it, I wished that we had created more. For nostalgia purposes, obviously. By the way, if you'd like to see the entire list of old videos, you can access our old YouTube channel by going to our old YouTube channel at https://www.youtube.com/user/tldgxqx19/.